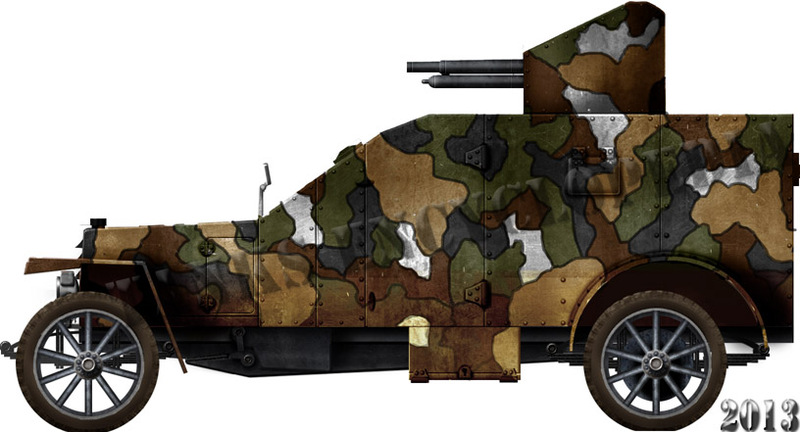 When the war has started in August 1914, France already had a history of armored car development. The earliest was the Charron model 1905. 4 Charron CGVs were already in service since 1908, and some had been exported to Russia. Peugeot entered the fray in 1914, delivering an entire array of armored cars based on tourism vehicles. They used the chassis of the Peugeot 146, 148, but more usually of the commercial 4×2 model 153, and makeshift armor arrangements. They had no standardization and, by late 1914, this improvised series was stopped. At the same time, Peugeot devised a better armored standardized model, based probably on the 148 chassis and delivered in two distinct series. The Peugeot model 1914 AC (for “autocannon”) was fitted with a standard Schneider 37 mm (1.45 in), short-barrel model 1897 field gun mounted on a central pivot. It was based on the Peugeot 18CV chassis. Over 150 were built in all. The first series AC-1 received a completely open platform and the gun was protected by a curved shield. The second model, AC-2, had a fully traversing turret at the rear, an open-top fighting compartment, but completely armored engine hatch, sides and driver compartment, with 5.5 mm (0.21 in) iron plates. The armor was designed by Capt. Reynaud. Access was through a rear door and on the sides of the driver compartment. To compensate for the extra weight, the rear tire was doubled. The driver compartment received only two small vision slits, but the fighting compartment sides were sometimes given small hatches. The normal crew comprised a driver, commander, loader and gunner. The other model was based on a Peugeot 20CV chassis, as the Peugeot AM (for “automitrailleuse”) mod.E1. which was generally equipped with a model 1914 Hotchkiss 6.5 mm (0.25 in) machine gun. 120 of these were built. The two were very similar in design and parts were interchangeable. By early 1915, all were simply called “Automitrailleuse Peugeot”. By August 1914 some cavalry units were equipped with Peugeot AM cars, notably the 6th and the 7th Armored Car Groups (7th Cavalry Division) and the 1st Cavalry Corps. 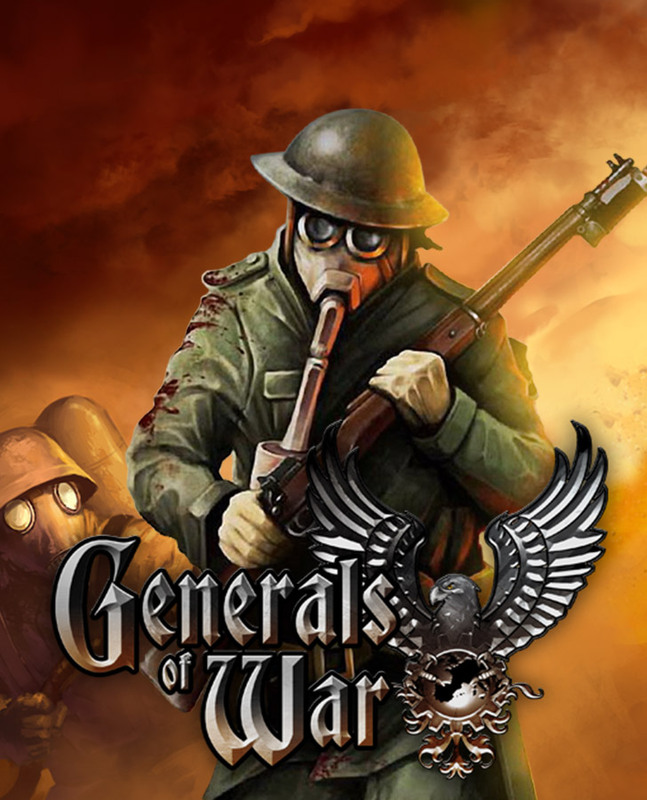 Within the first stage of the war mobile warfare allowed them to add their full potential to infantry support on the spot and patrolled well behind enemy lines. But in 1915, when the stalemate began, they saw themselves of limited value. They mostly served to patrol the frontline on open roads and bring fire support when needed. But their off-road capabilities were severely reduced. 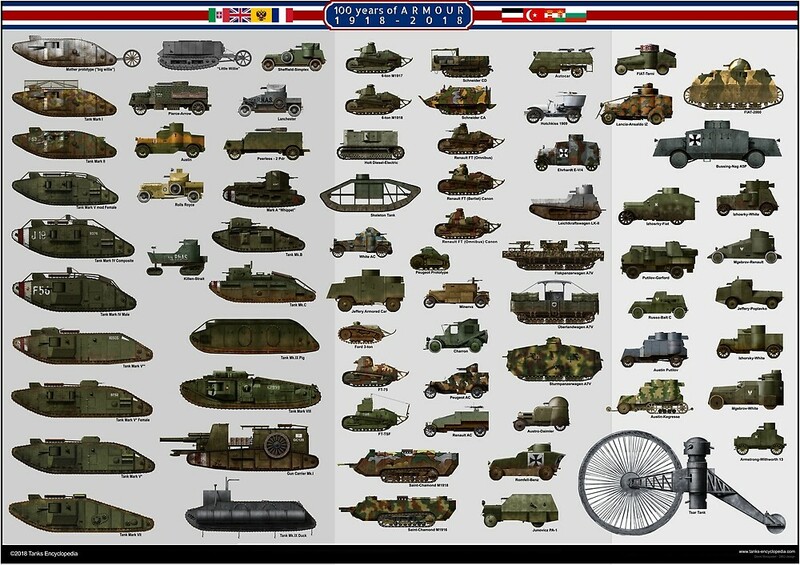 When the war became more mobile in 1918, only 23 were left. The production had slowed down since 1915 and no replacements had been allocated. 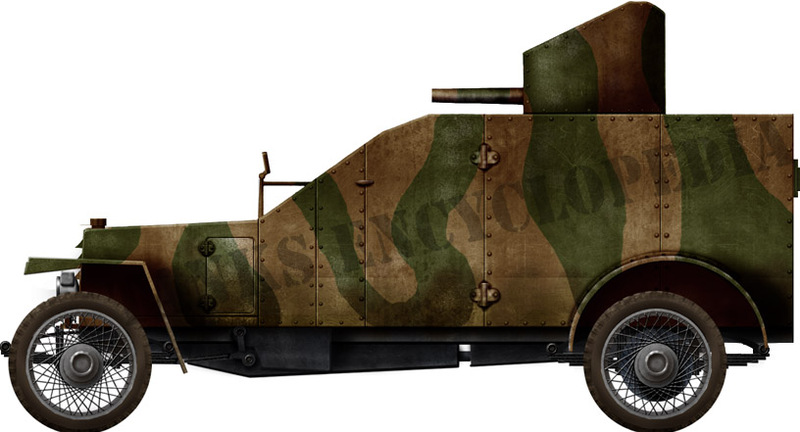 By 1919 the Polish government, threatened by the degenerating situation in Russia, tried to purchased French armored cars, and only received 18 Peugeot AMs in August 1920 along with spare parts. They were shipped by sea and arrived in September-November 1920, too late to be effectively committed in operations. Three were armed with guns, with three more rearmed afterwards. The rear fighting compartment had sloped flanks as seen on photos, unlike the regular models, which makes some sources speak of a new postwar modified “model 1918” version. 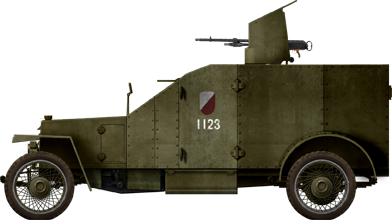 After their arrival they formed an Armored Car unit based in Poznan and later the 1st and 2nd Armored Car platoons. These units were frequently rearranged during the twenties. In May 1926, during Józef Pilsudski’s coup, two assisted government forces, and one was damaged during the street fighting. They received, in the early 1930s, a small overhaul in the CWS workshops, with a new strengthened gear. Already in 1930 their replacement by the wz.28 halftrack was in full swing. Considered obsolete by 1931, they were lent to the police for training and patrol duties. By 1935, they nearly had all been retired, but three remaining in service with the police took part in the border fight on the 1st of September 1939 in Upper Silesia and dealing with the German Freikorps. The remainder were destroyed during the war. Four Peugeot AMs were also lent to the Serbian government to deal against Bolshevik incursions, and later reused by the Yugoslavian kingdom. They seem to have been kept in service until the German invasion in April 1941, but their fate is unknown. Peugeot AM, armed with the Hotchkiss machine-gun. Early camouflage. Unknown cavalry unit on the Marne river, late 1914. 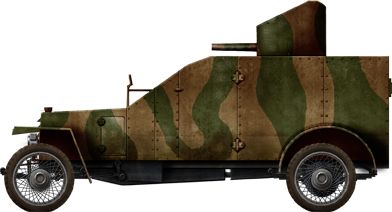 Peugeot armored car AC-2, with the short-barreled mle 1897 Schneider field gun and spoked wheels. Also notice the late “Japanese style” camouflage. Yser front, summer 1918. In 1916 they were rearmed with Puteaux guns, carrying 400 rounds. By 1918 they served as fast infantry support. Samochod Pancerny Peugeot AM in service with the Polish Border Police, 1st of September 1939. 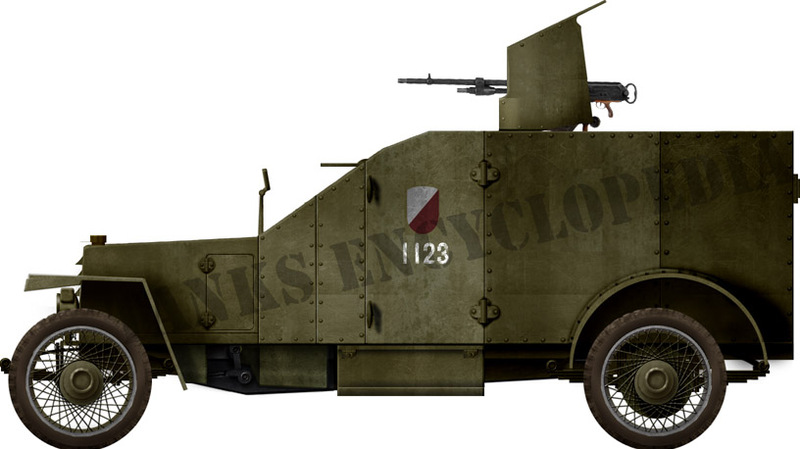 They were probably the oldest AFVs in service in Poland and fought with the German Freikorps and other advanced elements of the German army near Katowice. 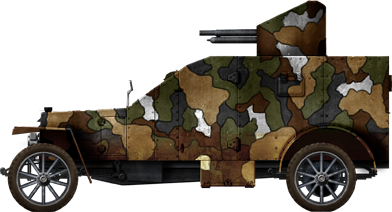 The six gun-armed cars (named after Lithuanian queens) received a 6+594437 mm (1.45 in) wz.18 (SA-18) Puteaux L/21 with 40 rounds. The other 8 (named after Lithuanian kings and princesses) received a 7.92 mm (0.31 in) Hotchkiss wz.25 and narrower shields. Among other modifications they received new headlights and a big searchlight, new rear sloped compartment, extra storage boxes and reinforced gear. Their chassis number was painted next to Polish blazon.